Frogs can be very useful in the garden eating more than their share of slugs. On a warm day from February onward frogs and toads will emerge from hibernation, mate and lay eggs as spawn. Do not worry about too much spawns as one frog will lay up to 2000 eggs of which only half a dozen become adult frogs. If you get far too much spawn so that it is chocking the top of the pond you can transfer some to a bowl so you can watch the tadpoles develop over the next 6 weeks or so. Transferring spawn to another pond may transfer disease or unwanted plants. Toadspawn is formed in long strings rather than the clumped or bunched frogspawn. Newts put there spawn on the underside of leaves. The following points are a guide on how to care for frog spawn and tadpoles. 1. 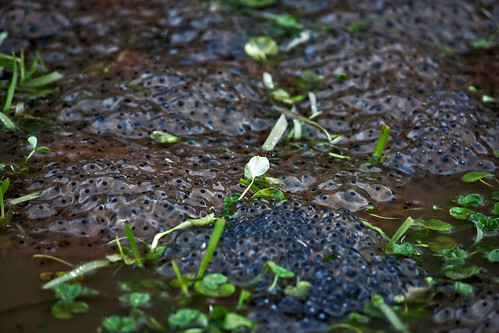 Unpolluted pond water or rain water are ideal for frog spawn. Do not put frog spawn into tap water unless it has been allowed to stand for about three days. The water should be changed at least twice a week to avoid contamination. 2. Water temperature is very important, between 15 degrees Celsius and 20 degrees Celsius is the best temperature for tadpole development. Pollution can be a problem if the temperature rises above 20 degrees Celsius. 3. Do not put frog spawn or tadpoles from water at one temperature straight into water at a different temperature. Death is likely to result! If you want to transfer frog spawn from a small container into a larger container, an aquarium for example, then stand the small container complete with frog spawn inside the large container, When both water temperatures are the same, which may take a few hours, then at last you can release the frog spawn into the aquarium. It is most important that the frog spawn or tadpoles do not over-crowd the containers at any stage. 4. When the tadpoles first hatch they can be given lettuce leaves to eat. A quantity of fresh pond weed in the aquarium at this stage is very important; partly as food and partly as support for young tadpoles. Nettle powder, made from dried stinging nettle leaves, can also be fed to the young tadpoles. 5. Feed lettuce leaves, etc. until the tadpoles reach the leg stage of their lives. Supply fresh pond weed if necessary when the water is changed. 6. When tadpoles reach the leg stage they become carnivorous (meat eaters). They will eat each other unless you provide meat for them. Small pieces of liver should be carefully suspended on a piece of string into the water. The meat should be changed every day to avoid polluting the water. Fish fry food for livebearers, available from aquarium and pet shops, can also be fed sparingly to the tadpoles at this stage. 7. When tadpoles reach the leg stage, make sure that stones are placed in the aquarium in such a way that the young frogs, when they develop, can climb clear if the water to breathe. 8. The whole process of change – from tadpole to young frog – takes about 12 weeks. 9. When the time comes to release the young frogs into the countryside, put them in as safe a place as you can. Don’t put them in a place where they will come into contact. 10. Spawny meant to be lucky without trying when I was a youngster but to look after wild life you need to be caring not rely on being spawny. See also What is New for Ponds in 2010. See our report on ‘Organic pond habitats for green gardeners’. iv just had my first lot of frog-spawn (28 feb) and i have noticed some of the black dots are white the same thing happened last year hence no frogs very disapointed why is this do you think ?